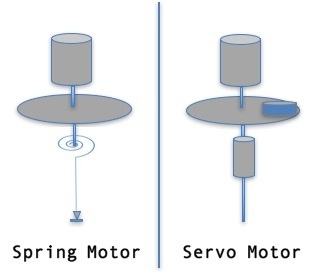 Spring motors use a spring to measure the torque required to turn a spindle in the sample. For the purposes of this article, we’ll refer to these instruments as “spring viscometers”. Springs are designed to measure a specific, limited viscosity range. That’s why you’ll see spring viscometers labeled as LV (low viscosity), RV (regular viscosity) or HV (high viscosity). With frequent use, springs can lose the ability to give accurate readings. Transporting the instrument can also damage or de-tune the spring. That’s why, with spring viscometers, frequent calibration is essential. During a test, spring viscometers require time to stabilize before offering a valid reading. Within the category of spring viscometers, there is a type of instrument known as a "dial-reading viscometer". Dial-reading viscometers are extremely basic units that require a conversion factor to obtain a viscosity reading. They are quick and easy to use, but do not offer the capabilities of timed testing, multi-step testing, or data recording that you'll usually find on other spring viscometer models. The full model range of spring viscometers can be anywhere from $2000-10,000. Some dial-reading spring viscometers may be found for less than $2000. The other category of rotational viscometers utilizes a servo motor system to measure torque, bypassing the need for a spring (in this article, we’ll call this category “spring-less viscometers”). A spring-less viscometer can measure a full viscosity range – LV, RV, and HV – in one instrument. Spring-less viscometers are more durable, and rarely need re-calibration. To be safe, unless you see irregular results, you could calibrate the instrument just once a year. Spring-less viscometers will give you instant viscosity readings. Spring-less viscometers cost around $3500-11,000. Keep in mind that these price ranges - for both spring and spring-less viscometers - don’t necessarily include spindles or accessory equipment (software, temperature control, etc.). These items can add roughly $500-10,000 to the total configuration costs. Viscometer prices are also dependent on the technical features of the instrument. Speed settings, spindle compatibility, and the ability to transfer test data to a computer are just some of the features that can affect the pricing of a viscometer. A viscometer that is lower in the price range will generally have fewer technical capabilities. Some viscometer brands include a bayonet fitting (an easy-on-and-off style of fitting) for spindles and sample tubes and touch-screens for easy navigation on every model, which can make them a little more expensive. Other viscometer brands may only offer these features as an upgrade. Both spring and spring-less viscometers come in a range of models from the most basic to the most technical. For the purposes of this article, I am going to qualify these models as Basic Level, Mid-Level, High-Level, and Rheometer. Starting from the Basic Level, each model builds on the features of the previous model. A Basic Level model will, of course, be less expensive than a Rheometer, but it will also offer more limited capabilities. Basic Level: Usually offers the smallest speed range and number of speed settings, and a smaller torque range. No temperature monitoring or control. No software compatibility. Rarely offers printer or computer connection for saving and/or printing results. May only be compatible with a few, specific, spindle types. Mid-Level: Sometimes offers temperature monitoring, and perhaps limited temperature control (attained by accessory equipment). May offer connection to computer/printer, and software compatibility for external operation of the viscometer. May have a greater range of spindle compatibility. High Level: Wider range and greater number of speed settings. Wider torque and viscosity measuring ranges. Almost certainly offers temperature monitoring and compatibility with temperature control accessories. Connection to printer/computer available, as well as optional software for external control. Can save one-step test parameters and test results directly on the instrument. Offers the widest range of spindle compatibility. Rheometer: In addition to the capabilities of a high level viscometer, rheometers can do things that regular viscometers can’t do, such as measure yield stress and fit flow curves directly on the instrument. Both spring and spring-less viscometers have a lot of good to offer. I hope this article has helped you understand the factors that go into the pricing of rotational viscometers. Learn more about these and other instruments that test viscosity -- download the PDF below. P.S. If you’d like some advice on the right choice of viscometer for your application, contact us today. We’d be happy to help you find the information you need. P.P.S. Did you know that you can subscribe to these exposés, rants, raves and ramblings? All you have to do is enter your email address into the box just to the right of the title.